You are here: Home > Does Mentoring Girls in STEM work? 75% of the fastest growing occupations require science, technology, engineering and maths (STEM) skills. The variety of professional roles open to graduates is much greater than those accessible through year 12 completion. 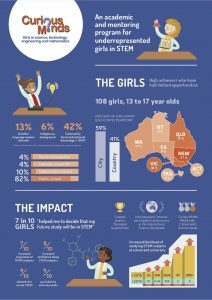 Yet girls and women are severely under-represented in STEM subjects at school and university. That means fewer women in occupations requiring STEM skills – and in the future that’s likely to be most of them! 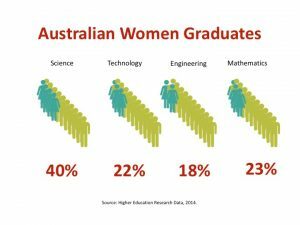 Why so few girls in STEM? The number of high school students taking intermediate and advance maths has been dropping for the last 20 years and girls participation is significantly lower than boys. Given that higher level maths is a prerequisite for engineering, IT and science at university, girls progress will be blocked. We are getting some traction in challenging gender stereotyping. Disney was chastised in a social media campaign #WheresRey, after it failed to include the woman protagonist of a recent Star Wars movie in the figurine merchandise. Meanwhile, we’ll see a female lead in the next Dr. Who series and Lego has released a mini set of female scientists (the idea of geochemist, Dr. Ellen Kooijman). There is still a long way to go. Obviously, mentoring isn’t the complete answer, but it has a lot to offer. 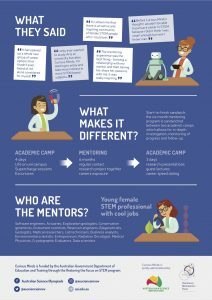 What do mentors do for girls in STEM? Recently released findings show the difference mentoring makes for 13-17 year old girls. The Curious Minds program, funded by the Australian Government and administered by Australian Science Innovations and Australian Mathematics Trust, is now in its third year. One hundred and eight high achieving girls with limited opportunities participated in Curious Minds between 2015-2017. The infographic below tells the story. A similar program for boys and girls DigIT, began in 2016 and links students with professionals in ICT related occupations. Both programs sandwich 6 months of mentoring between 3-4 day academic camps involving supercharged sessions, excursions, guest lectures, career speed dating and experience on a university campus. A program that is partnership between the Australian Mathematical Sciences Institute and the BHP Billiton Foundation runs a different model. CHOOSEMATHS uses online mentoring circles to change attitudes, increase participation in maths studies and improve maths-related career choices for girls. I’ve had the privilege of working with all three of these programs. What I’ve noticed is the passion of the (mostly female) mentors and organisers. It is a thrill to see students’ enthusiasm for STEM grow and the innovation and creativity of their projects and presentations at the end. “The growth of jobs requiring STEM skills far outweighs the growth in other areas. and boys who participate, they are vital for al of us. We need all the young people we can to develop their talents and skills for the future, so we all survive and thrive in an exciting and demanding world built on science, technology, engineering and maths.